Our second location, opened in 2016, is nestled in the middle of the quaint and walkable Sylvan Park neighborhood. Families and friends alike visit us in Sylvan Park for all of their hair needs, often bringing their four-legged friends along. Next door to answer. and just around the corner from Star Bagel & Edley’s BBQ, you’ll be able to grab a delicious meal in addition to your fresh cut. We encourage clients to park in the designated spots located in front of our entrance or in the lot behind our building. If you’re looking for the cut you want when you need it, just walk in, call ahead, or check-in online any day of the week. You can request your favorite stylist or see any of our talented staff! 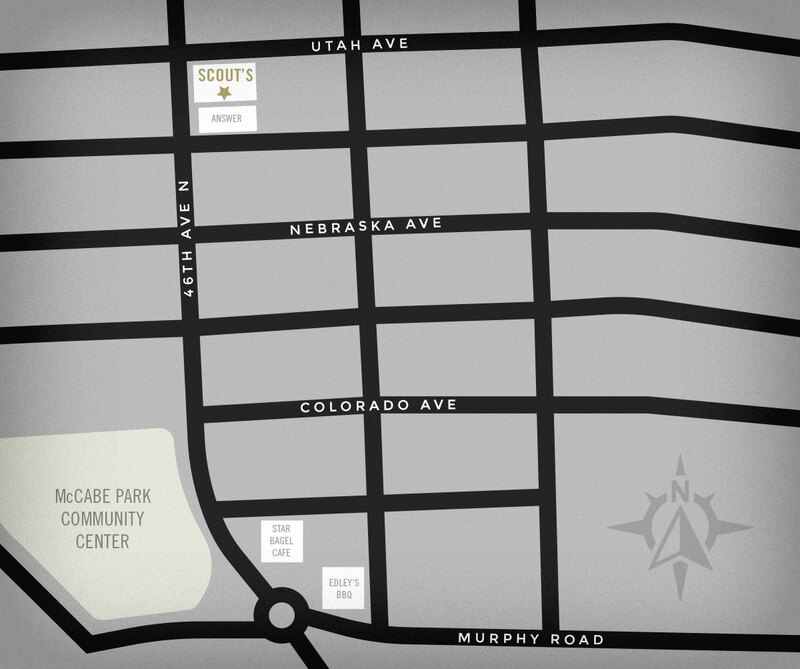 Scout’s is not appointment-based, but you can plan your day and save time by calling ahead or checking in online! online every day of the week! Proudly supporting our Nashville community, we serve locally roasted coffee and brewed craft beer! Our cold brew features Honest Coffee, roasted inside the Historic Franklin Factory. Little Harpeth Brewing beers are on tap at each shop with a rotating selection of traditional German lagers, consistent with the beers of pre-prohibition Middle Tennesseans. Come thirsty and enjoy a free beverage while you get your cut! Check in at the front desk and add your name to our same day waiting list – you are welcome to request your favorite stylist. 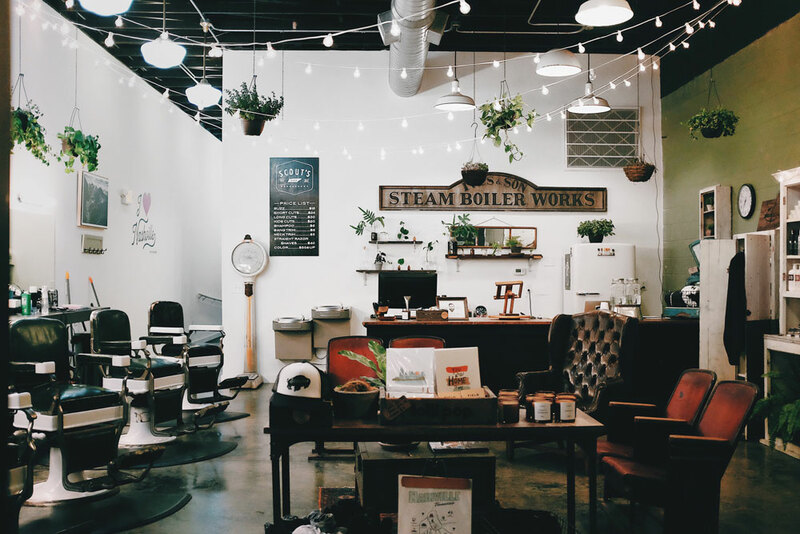 Your receptionist will estimate an approximate wait time and you’ll be offered a free beverage to enjoy while you wait to be called by your stylist. You may add your name to the same day wait list by calling ahead and speaking with the receptionist. We ask that you call an hour before you’d like to get a cut, so that we can eliminate the majority of your wait time before you arrive. While on the phone you may request a specific stylist and the receptionist will estimate an approximate wait time. When you arrive at the shop, please check in at the front desk, and grab a beverage to enjoy while waiting for your stylist. You may add your name to the same day wait list by checking in online and choosing the time that you’d like to come in. Checking in online is not the same as creating an appointment and you will only be able to select a time slot for the same day. By checking in online you are adding your name to our wait-list and will be seen within fifteen minutes of your selected time. When you arrive at the shop, please check in at the front desk and grab a beverage to enjoy while waiting for your stylist.